At Crescat we remain positioned to capitalize on a downturn in the economic cycle. Global equity markets peaked in January 2018 while US markets peaked in September 2018. Crescat’s hedge funds were two of the world’s top performing funds in 2018 as a result of our bearish macro views and positioning last year. 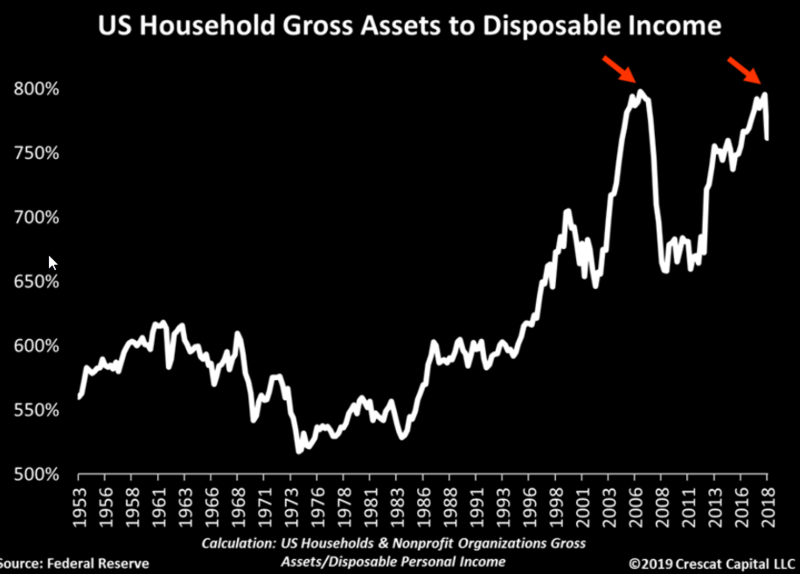 We are confident that was only the beginning of a downturn in asset prices from record global leverage and central-bank-driven asset bubbles for this cycle. US asset bubbles only just began to burst at the end of last year as one can see in the chart below. Year to date, global stocks and corporate credit securities have rallied sharply while economic indicators have continued to deteriorate. This is setting global risk-asset markets up for another down-leg. We haven’t even had a recession yet to end the economic cycle while US stocks are still near record valuations across a breadth of measures. There is tremendous shorting opportunity ahead! With the current quarter, we are now in a tie with the 1990s for the longest US economic expansion ever. 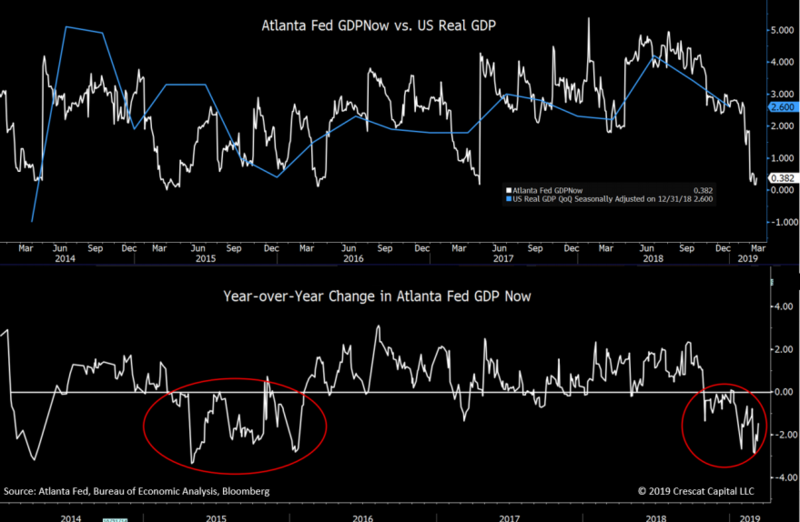 Crescat’s macro models show that the expansion is about to turn into a recession within the next several quarters based on an abundance of indicators. How do we get to a recession? The US stock market and corporate credit bubble must burst first. That is how the business cycle works. It started in the fourth quarter, but that was only the beginning. How do bubbles burst? The smart money sells first from record valuations, then the rest of the world follows. 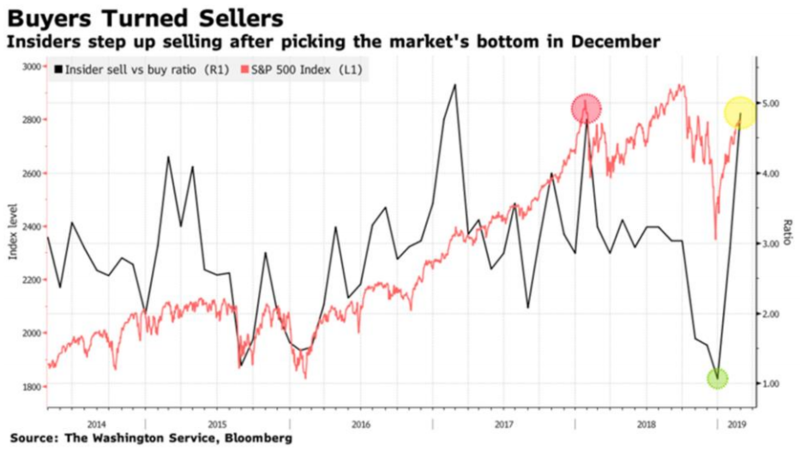 Note in the chart below how insiders began selling heavily in early 2017. But the rest of the world did not follow. The stock market kept going higher. So, they sold again in early 2018. That time, the stock market finally began to falter. Global stocks peaked at that point for this cycle and kept going down. But the US market went to new highs again in September 2018. Now insiders are selling heavily again in early 2019. The third time should be the charm for the stubborn US market. We will lay out some of our current bearish timing indicators in the charts below. 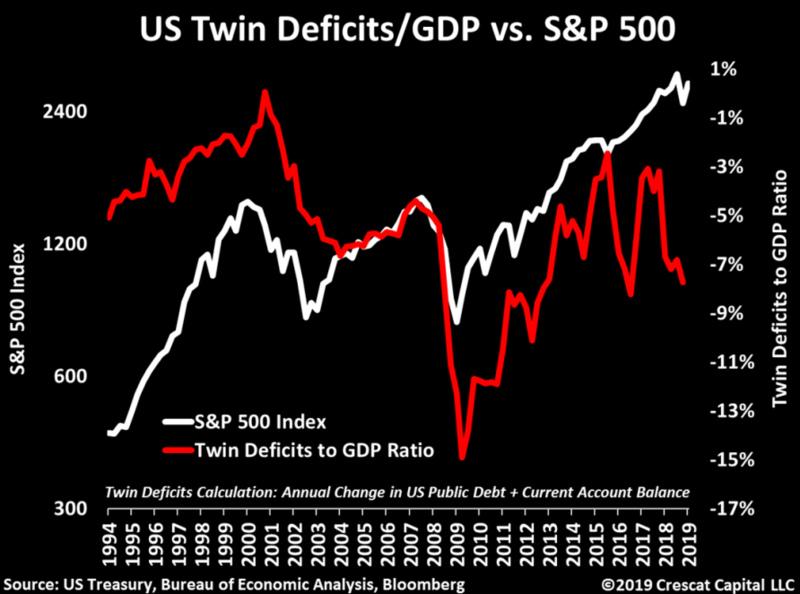 The US twin budget and trade deficit is diverging from the S&P 500 signaling the likely peak of the stock market and business cycle on the heels of the tax cut. Meanwhile, US hard economic data is showing a sharp deterioration in GDP in the current quarter. 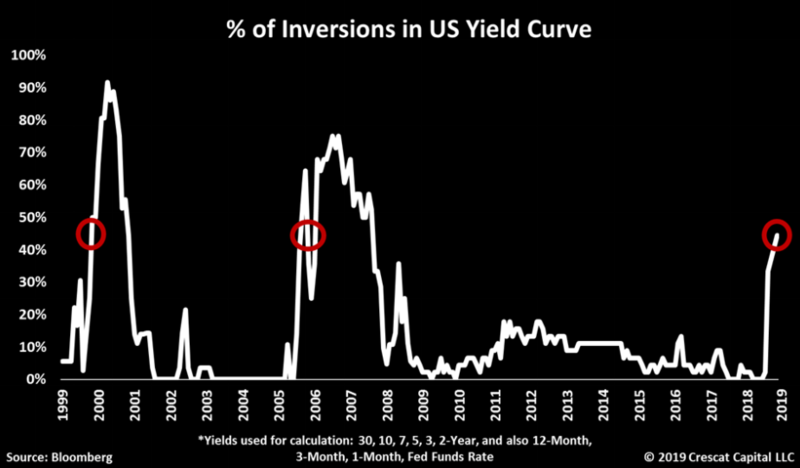 The percentage of inversions in the US yield curve is now close to 45%. The last two times the credit markets had such a high distortion, asset bubbles began to fall apart shortly after. It’s also important to note how the percentage of inversions was insignificantly low in 2016 when the business cycle was extended. We strongly believe this is not another 2016 soft-landing scenario, instead the beginning of a bear market. As we have shown extensively in our past analyses, China today is far and away the biggest Ponzi credit bubble ever while the world remains largely oblivious to the risks. We believe China’s credit bubble is ready to burst. In our global macro fund, we are short the Chinese currency, the yuan, as our primary way to express this theme. 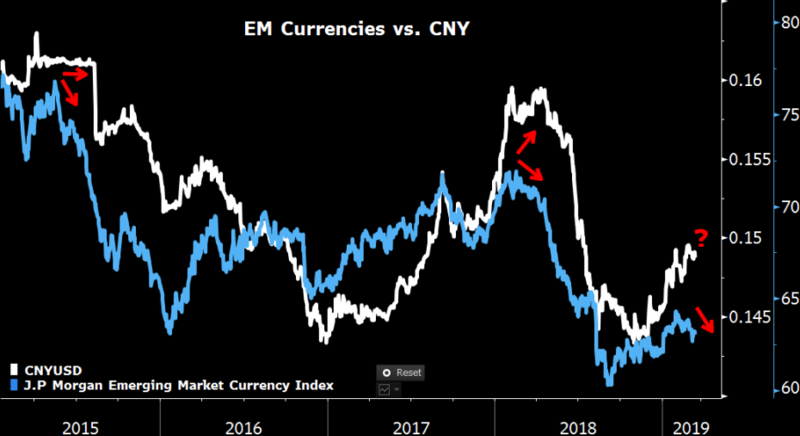 An important divergence to be noted today with respect to our yuan short is the recent selloff in EM currencies that is likely foreshadowing a new CNY breakdown. We had similar setups that we profiled in our letters ahead of both the 2015 & 2018 devaluations. In hindsight, those selloffs were nothing in the big scheme of global currency crises, just mini-devaluations. They nonetheless rocked global financial markets. Imagine what an all-out yuan collapse would bring. A Chinese currency crisis is inevitable in our analysis, and it’s overdue. The correlation between the Chinese equities and the Chinese currency is at an extreme. They were going down together last year, but recent PBOC stimulus has led to both going up this year. China cannot have its cake and eat it too. China’s new fiscal and monetary stimulus measures are unquestionably bearish for the yuan. During periods of crises in emerging market economies, asset classes can behave very differently. The one prevailing pattern is that gold prices almost always rise in local currency terms. Given our negative views on the Chinese yuan, and because we believe gold is historically cheap versus all fiat currencies, including USD, we are extremely bullish on gold. But 7 we are most bullish on gold versus CNY. As shown below, gold in yuan terms broke out from a three-year resistance line and it’s now at the lower bound of an upward channel. We continue to think gold in CNY terms is an incredibly bullish setup! To understand the primary positioning in our global macro fund in the simplest macro terms possible, one could think of our fund as being long historically undervalued precious metals in CNY terms, or long the XAUCNY cross, and short record overvalued global equities. The chart below shows a representation of this trade based on a 3-asset model (gold, yuan, and global stocks). The chart shows the historical performance of this model: 100% long gold vs. CNY (XAUCNY); 100% short the MSCI World Index. It’s remarkable how well this trade would have worked during all major cyclical turns in the Chinese and global economy in the last 40 years! This is a value-oriented macro trade that is likely to perform over the next 1 to 3 years in a global economic downturn led by an imploding China. The model explains roughly 75% of the basic positioning of our global macro fund today. 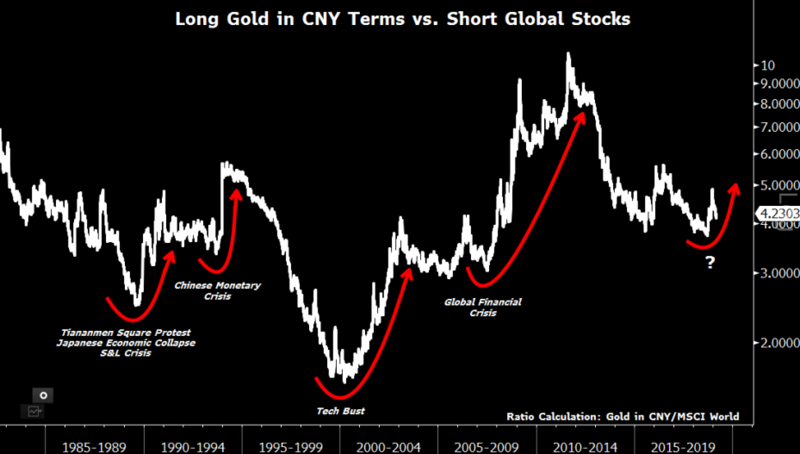 We believe that long gold in CNY terms versus short global equities today could be the macro trade of the century! But we are trying to do even better than this simple model. We are balancing and managing our overall exposure with a conditional value-at-risk model. We are also going for high alpha versus the indices through individual stock selection. We strongly believe these enhancements will be key to our ability to outperform this model on a risk-adjusted based. For example, silver does better than gold – and gold and silver stocks do even better than gold – in gold bull markets though we own gold at the core. And carefully selected stocks can do even better than gold and silver stock indices. Similarly, on the short side, our equity model helps us select stocks to short can do much better than shorting the MSCI world or the S&P 500 index. The shorting opportunity is best when one is early in the process as our returns in 2006 and 2007 from the peak of the housing bubble prove. Our performance last year demonstrates it as well. But it is likely only the beginning of a global macroeconomic downturn! Soon the buy-the-dip mentality and bull-market greed will turn to fear. Selling will beget more selling. That’s how bear markets work. There is so much more imminently ahead for us to profit from on the short side of the market. The bear-market rally is running out of steam! We believe it is a great time to invest in Crescat’s hedge funds after our pullback year to date given our steadfast net short positioning that we intend to maintain until a US recession is widely acknowledged. We remain tactically net short global equities near the likely top of a global economic cycle. The downturn is likely to be led by a China currency and credit crisis with US stocks also falling from record valuations after a record-long business cycle. We are determined to prudently position and profit for our clients.